I read over breakfast today how giant retailer Toys R Us will will close or sell all 885 US stores in the coming months, putting 33,000 jobs at risk (1). All the UK stores will close in the next six weeks. So, a company sold for $7.5billion only 13 years ago is now dead in the water. I explore below the reasons for this dramatic demise and what we can learn. Like all retailers, Toys R Us has had to cope with intense competition. In particular, Amazon has led the growth of competitively priced toy sales on the internet, that grew 60%+ in the last five years in the UK (2). However, the majority of toy sales (63%) are still in physical stores. And successful retailers are using an ‘omni-channel’ approach to blend the best of on and offline shopping. John Lewis has trebled online sales from £0.5 bill in 2011 to £1.6bill in 2016, for example (3). So, whilst retailing is clearly one of the most intensively competitive markets around, this alone doesn’t account for the collapse of Toys R Us. A bigger issue for Toys R Us seems to have been a failure to rejuvenate the customer experience. First, there is the distribution model. Toys R Us was built on huge out-of-town stores. These worked well in the 1990’s, with people prepared to make a trip to access a huge range of toys under one roof. However, with the growth of online sales, this wide range is less of an advantage. And being out of town can mean being out of sight compared with rival outlets. “We’re more likely to be lured into a high street shop by someone demonstrating a remote-controlled helicopter,” suggested a BBC article (4). 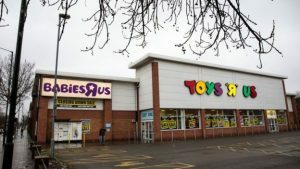 But surely the leaders of Toys R Us had the data showing the move to online shopping and away from ‘big box’ out-of-town formats, and had been told of the need to improve customer experience. The company’s demise was not inevitable. To quote Steve Dresser again, “They signed their own death warrant”. But why would any company do this? Why did they fail to rejuvenate their brand? Digging deeper, I found that the leadership of Toys R Us had a huge weight around their neck, one that eventually dragged them under the water: a huge debt pile. The company was bought for $7.5 billion in 2005 via a ‘leveraged buyout’ (LBO) by Bain Capital, KKR & Co. and Vornado Realty Trust. The leveraged bit involved using debt to fund the deal, saddling Toys R Us with onerous loan repayments. To make matters worse, operating margins had already declined in the face of competition from Walmart, dropping from 8.2% in 1997 to 2.8% in 2005 (5). Even though the company still managed to make an operating profit, this was swallowed up by interest payments. In the latest reported 12 months, pretax income was -$492 million, according to Bloomberg (5). There was simply no cash to spend on remembering and refreshing what made the brand famous. The really sad thing is that despite all the massive challenges, Toys R Us actually managed to maintain revenues: 2017 sales of $11.1 billion were bang in line with those of 2004, the year before the buyout. With the right management, perhaps the business could have delivered steady if not spectacular growth and still be alive today. 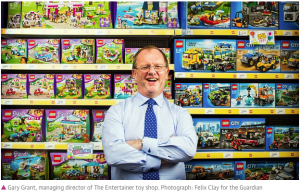 The success of toy retailer The Entertainer is proof that Toys R Us’ decline was not inevitable, and gives inspiration to big brands who need to rejuvenate themselves. Gary Grant and his wife Catherine started the business back in 1981, after buying a local toy shop in Amersham, Buckinghamshire. Today, sons Duncan and Stuart are respectively commercial director and head of buying. The company recently reported sales from its 150 stores up 6%, with gross margins also increasing (6). The retailer plans to open 15 new shops in 2018 and refurbish its Westfield London store, adding new interactive displays. 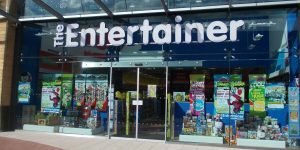 The Entertainer has thrived by doing the things that Toys R Us failed to do. Location: store locations focus on busy high streets and shopping centres. A tight management structure coupled with private, family ownership has helped The Entertainer zip like a speedboat as it responds to trends. “We do what’s right for the business. We do not have to prove anything to anybody,” says owner Grant. Contrast this with the slow moving supertanker that was Toys R Us, holed below the waterline by its debt burden. In conclusion, big brands are not all doomed to decline and die like Toys R Us, but they do need the right leadership to rejuvenate if they are to survive and thrive in today’s hyper-competitive markets.